"My son's body was completely covered with scars." On Aug. 3, a mother with the surname of Liu dropped her 18-year-old son off at a center in Fuyang, China, to treat him for his supposed internet addiction. Two days later, she picked up his body from the morgue, where was covered head to toe in scars. "When I sent my son to the center he was still fine," she told BBC. "How could he have died within 48 hours?" A doctor told the teen's parents that he had sustained more than 20 external injuries and several internal injuries, but his exact cause of death is still unknown. Some of these so-called boot camps that promise parents a quick fix for their children's internet and gaming addictions are known military-style discipline. Many have been called out for their overly harsh practices, and with Liu's son's death, people now know why. The center they sent their son to told them they would use a combination of "psychological counseling and physical training." Some camps have been accused of beating their patients and using electroshock therapy. The director and four teachers of the center where Liu's son died are being held by police. It's shut does as an investigation is currently being done as it was an illegal camp that had already been ordered by officials to shut down. According to the Washington Post, a 15-year-old and a 19-year-old were both beaten to death while attending one of those camps. In 2015, a teen battling an internet addiction cut off his own hand. 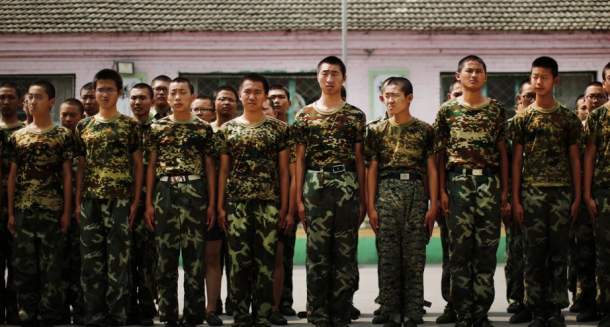 In 2014, the Chinese government built about 250 boot camps to help get rid of the increasing internet addiction. Parents elected to send their children to the camps,; many of the kids spending the majority of their waking hours online. With tragedies like Liu's son being highly publicized, the future of these camps is unknown. A photographer who visited one of these camps in 2016 didn't tell of any abuse but said the constant repetition probably wasn't curing anyone. "Their personalities are annihilated," he said. They stay "behind a formal posture of silence and obedience. They don't show any sadness, but I'm sure they miss families and friends." "It's very harsh for a kid to live such experience," he said. "I don't think this is helpful." Officials who lead the center believe in the methods they use — mostly to help those with serious gaming addictions who often play for 30 hours straight — cure "most" addictions. While treatments for internet addictions are being studied by some psychologists, it seems like these secretive, military-style boot camps are (thankfully) on their way out.